During the summer of 2012 a major auditorium renovation project was undertaken to provide a facelift to our 50 year old auditorium. The new auditorium now features brand new seats, fresh coat of paint, new flooring and carpeting and handicapped seating. Please help us to Fill the House and dedicate a seat or seats in honor of yourself, a family member, friend, faculty member or a memorial for a deceased loved one. Each seat costs $250.00. 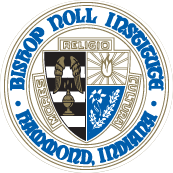 You may pay online or mail a check payable to Bishop Noll Institute to at the attention of Mary Ellen O'Neill.